Just after I got back from Costume College (and I mean literally just after I got back, as in the day after I got home) I started working on the petticoats for my 1840's dress. I don't even remember how exactly it started, but sometime during the trip Michaela and I were talking about 1830/40's fashions and how they are a bit... odd (mostly the 1830's). And at some point I decided to make an 1840's dress, which lead to lots of Pinterest research in between classes. As you know if you read my post about Costume College, we went to the fabric district, which is where I found my fabrics. 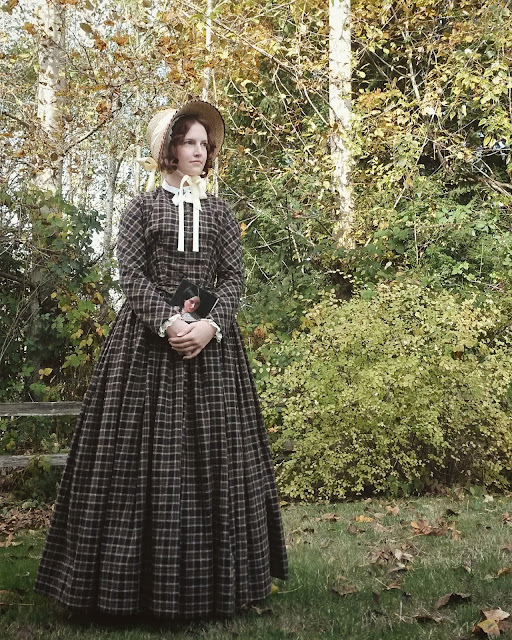 I ended up with the perfect brown plaid linen along with plain white cotton for the petticoats. I think I ended up spending under $50 for all the materials on this dress. 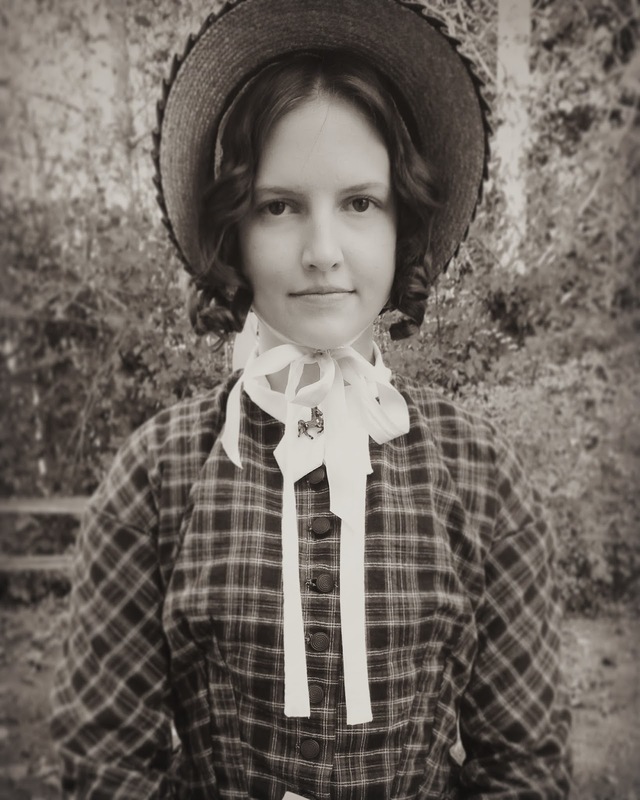 I decided to wear this dress for Halloween and go as Jane Eyre, since I've recently become obsessed with that story. The pattern I used was Laughing Moon #114, which I modified the shape of the front to be more of a sharp point. The dress was soooo easy to make and was quite simple. The bodice only has 3 pieces (plus sleeves) and is shaped with darts in the front, which made putting it together fairly quick. The skirt on the other hand is cartridge pleated, which is very time consuming (but looks so pretty in the end!). And even so, it didn't take all that long. This dress used over 7 yards of fabric, and I used a total of 10 yards for all 3 petticoats. So that's a total of 17 yards of fabric I'm wearing. I'm wearing a cap under my bonnet (I don't currently have pictures of it... Yet), which I sewed 100% by hand (which is something I've never done before). I made the bonnet out of a regular straw had from a thrift store. I didn't have time to buy an accurate base for a bonnet and had to make due with this, but it turned out better than I originally thought it would. These are just a few shots I got before going to a costume party last week, but I'm already working on plans to do an official photoshoot in the next month or so. I also want to get pictures of the undergarments and may even make a couple video's related to this outfit. OK, I love the bias cut sleeves! Was it a straight sleeve, or did it have any curve? 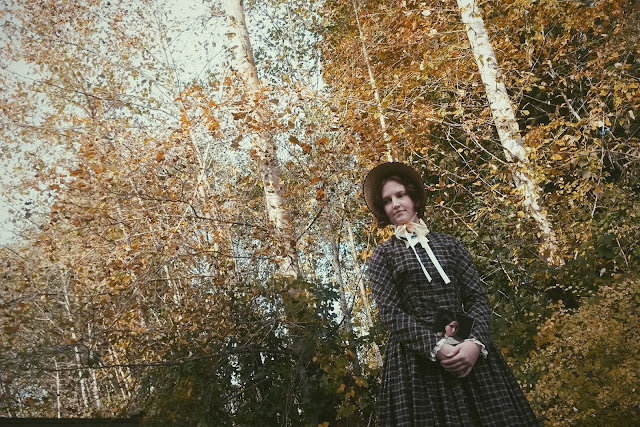 I've made an 1840's inspired dress for last Halloween, and even though the sleeves felt like they had enough room and they were cut on the bias, they were kind of tight and uncomfortable to wear. Also: totally obsessed with Jane Eyre too, but sort of secretly because no one in my family wants to hear about it. My mom read the book and she didn't really get it/like it. The sleeve is a two piece pattern (straight and not curved) but one of the pieces is longer than the other and is gathered at the elbow. I really like the fit and they're very comfortable! It's weird though because the mock up sleeves (which I ended up using to flat line the sleeves with) felt tighter than the finished sleeves even though I didn't make any changes to the them on the actual dress.